The difficulty of a rapid is referred to as the Class or Grade of a rapid. This river classification system provides a general comparison between rapids from one river to the next with a number being assigned to each rapid based on a combination of factors including the difficulty of navigating a rapid, the length/size of the rapid, and the skill/experience recommended for it. Class I – Small waves in moving water. There is a clear and easy to follow pathway through the rapid. Following this ideal route might require no or only slight maneuvering. Errors will often cause little to no problems. Class II – Some rocks and/or rough water in rapids may require some maneuvering to navigate through it. Typically straightforward rapids with wide clear channels and medium sized waves that are easily avoided or fine to hit. Errors can cause problems but there is often plenty of time to correct even large errors, and rescue is usually easy and quickly accomplished. Class III – Containing numerous waves, rocks and eddies. There might be a clear pathway, but that ideal route might be narrow, requiring good boat control. Staying within the ideal path will likely require a moderate level of navigation. Small errors can often be corrected before they cause problems. Class IV – Higher waves with irregular or challenging rocks and strong eddies. Might contain a considerable drop, holes or constricted passages. Powerful and/or precise navigating is required within Class IV rapids, sometimes including the necessity of sharp or quick turns/maneuvers, including moves above dangerous hazards. The ideal pathway (if there is one) may not be clearly obvious. Small errors can sometimes be corrected if acted upon quickly and precisely. Class V – Long and powerful rapids of exceeding difficulty often flowing directly from one rapid into another with little break between rapids. Eddies or places to pause mid-rapid are often small and difficult to reach. May contain large drops and very strong current. Top quality navigating is required from start to finish with minimal margin for errors. Small errors often cause problems with little to no time to correct them. Trained paddlers with a high level of fitness help guides maintain the correct pathway, and help facilitate rescue when needed. Class VI or U – Considered to be unraftable or unrunnable due to the extreme challenges presented by the rapid and the unlikely probability of being able to run it successfully on a consistent basis. For more details check out the International Scale of River Difficulty on Wikipedia. Looks: Calm Bumpy Turbulent Impressive Crazy No Way! Minor Errors: Unnoticed Unnoticed Bumpy Maybe Swim Scary No Way! Larger Errors: Unnoticed Bumpy Maybe Swim Scary Not Good No Way! Enjoyment: Relaxing Entertaining Super Fun Super Fun Super Fun No Way! The challenges presented by a specific rapid can change as the river flow or water level changes. As a general rule of thumb you might assume that more water makes rapids more dangerous and difficult. But some rapids can actually become easier with more water. As the features and challenges of the given rapid sink far enough below the water such that they are washed out and no longer affect the surface. With that said, rapids can also become more challenging with more water. With the water moving quicker, you will have less time to respond between obstacles. Sometimes that quicker water creates unavoidable waves and holes that previously were easily avoided. At other times the size of standing waves can significantly change, moving from a fun wave you used to just splash through, to a boat munching wave requiring great momentum to punch through it, or better yet avoid entirely. Sometimes, new pathways open up that can either cause new challenges, or provide alternate routes that are easier than the path you normally take at more regular flows. All of that to say, be aware of changing river conditions. Rating systems for a specific whitewater river can vary from one local to another. One class river or a specific set of difficult rapids might be easier for a kayaker versus a rafter, or might greatly vary based on water flow. Rafting is a fun but complex sport, and you should be respectful to the level assigned to each river and take the time needed to scout out a rapids water upstream and downstream before attempting it. Whitewater rafting with a qualified guide and commercial company on Class III, IV, and V rapids is a great and fun experience. 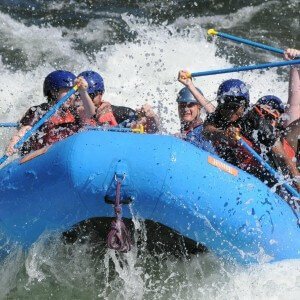 While you might get a larger adrenaline rush on the higher classed rapids, the overall amount of fun is relatively the same.